The Evenflo JourneyLite Travel System takes baby strolling to a whole new level – lightweight, easy to maneuver and incredibly comfortable for the little one. This outstanding travel system comes with an Embrace infant car seat that allows you to easily secure your toddler in place when you are on the go. If you are looking for a cost-effective and comprehensive travel system with a car seat embedded in it, then look no further than this one! In addition to this, the travel system is very functional, as it also comes with a generously sized storage basket, a covered parent console as well as a pivoting child tray. The durable design of the stroller aims to accommodate children that weigh up to 50 pounds, and the infant car seat has an outstanding safety rating that provides every parent with the peace of mind they so much need. With that in mind, this review will give you a deeper insight into the advantages and disadvantages of Evenflo JourneyLite Travel System with Embrace, as presented by parents on Amazon and not only. The Evenflo JourneyLite Travel System is currently unavailable. Here’s a list of the best travel systems currently available. Consider the Britax 2017 B Agile & B Safe 35, which is one of the highest rated travel systems today. 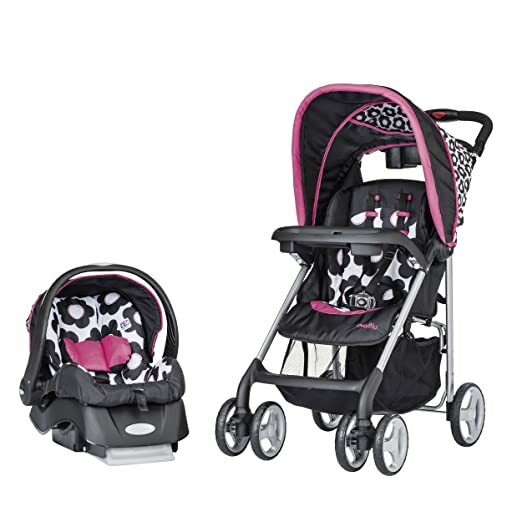 This baby stroller certainly stands out from the crowd through its great design and comfort rating – fully cushioned, the stroller features a multi-position reclining seat that ensures a very comfortable fit for the little ones, and it also comes with fully lockable front swivel feels that offer parents full control over the stroller. The infant car seat is tested for impact, and it comes with a separate stay-in-car base designed to allow parents to easily transfer their children from this comfortable travel system to the car. The seat is fully compliant with the Federal Safety Standards hat apply, and it has also been thoroughly tested for structural integrity – in other words, it is extremely safe! In addition to this, parents have also reported that the Evenflo JourneyLite Travel System is very lightweight and easy to fold, which means that it is compact and does not take too much space inside the car. Another positive aspect that parents seem to be thrilled about is the fact that it comes with a child’s tray with two cup holders that are very practical and functional, not to mention the cute overall design of the travel system. As impressive as this may sound, there are actually no negative reviews or downsides parents have complained about on Amazon – the Evenflo JourneyLite Travel System is just that good! Feature-rich, comfortable and lightweight, this travel system for toddlers also comes with a great price-quality ratio and will certainly help you get what you pay for. To sum it all up, the Evenflo JourneyLite Travel System seems to be the ideal stroller for babies. If you have a newborn that just loves the outdoors, then this outstanding travel system will keep him safe and comfy, as it is both durable and lightweight. This stroller is a pleasure to use not just by the toddlers, but also by parents, who certainly appreciate the fact that the stroller comes with a push and twist handle fold mechanism that takes just one second to fold and unfold the entire travel system! Baby Wrap Carrier & Which is The Best For You in 2017?